« Comhaltas ‘Summer Shows’ 2016 in Oriel Centre Dundalk Gaol. A convoy of classic Volkswagen Beetle cars & camper vans will descend on Market Square ‪#‎Dundalk between 1-4pm this Saturday. This year’s Meet & Display Showcase of the iconic vehicles will include a family from Belgium visiting Dundalk as part of a tour of Ireland. 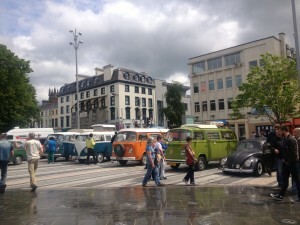 Local Volkswagen enthusiasts want to make sure that they receive a real ‘Cead Mile Failte’ on their stop in Dundalk so be sure to call to Market Square this Saturday to check out the vintage Volkswagen Campers & Beetles.